Thanks for your interest in our invitations and stationery. 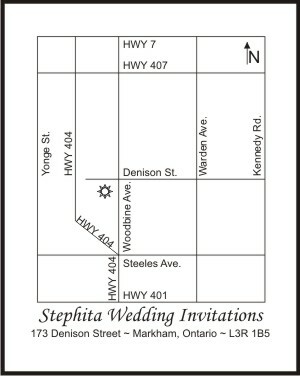 Please feel free to contact us to book an appointment to see our invitations at our studio in Markham. We have extended our showroom hours to accommodate more clients to visit us after work during the weeknights on Monday, Tuesday, Thursday and Friday as listed below. The hours below will apply during the busy wedding season of January, February, March, April, May, June, and July! *** We are typically open on Saturdays, but may not be able to answer the phones, as all our consultants are in appointments. If coming into our showroom won't be an option, we will gladly work with you over email or you can place an order over the phone. We can also send over 3 samples free of charge from our Classic line of invitations, along with any paper and ribbon swatches. Just let us know which ones you would like to receive and forward us your full mailing address. Feel free to contact us for immediate assistance. DIRECTIONS FOR CLIENTS VISITING OUR STUDIO IN MARKHAM, ONTARIO, CANADA! As of August 30th, 2007 we will be moving into our new showroom. If you visited us at our old studio in Richmond Hill prior to this date, please make sure you come to our new studio! We are conveniently located off Highway 404. Once you reach Highway 404, you want to reach the intersection of Highway 404 and Steeles Avenue. If you are traveling North on Highway 404, you will continue to go straight when you are on the Steeles Avenue exit ramp, passing Steeles Avenue, the Highway 404 becomes Woodbine Avenue. If you are traveling South on Highway 404, you will exit at Steeles Avenue, make a left so that you are traveling East on Steeles Avenue. Make a left onto Woodbine Avenue at the next traffic light. Denison Street is 3 traffic lights north of Steeles Avenue. Make a left onto Denison Street, we are located on the south side of Denison Street. If you are traveling by city streets, you will need to reach the major intersection of Steeles Avenue & Woodbine Avenue. You will need to go North onto Woodbine Avenue. Denison Street is 3 traffic lights north of Steeles Avenue. Make a left onto Denison Street, we are located on the south side of Denison Street. If you require more detailed directions, please don�t hesitate to contact us directly at 905.489.1199. PLEASE NOTE: If you are coming in for an evening appointment, street lighting on Denison Street and the business complex are quite dim, so you may not clearly see the street number driving in. Just look to your left (south side) for the entrance. Our office is at the end of the parking area, our office will be the one with all the lights on!